HTC is having a tough time in the market and the company is losing ground quite quickly. HTC’s marketing campaigns have been disappointing in the past and have resulted in the poor sales even though its latest smartphones have been pretty good. This time around, HTC will have few exciting offers for the early adopters of its One latest flagship. 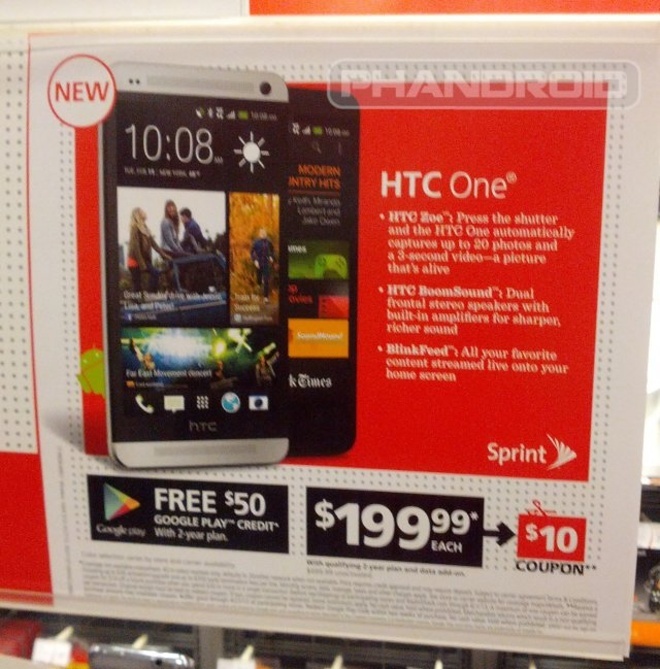 According to a leaked image from Phandroid, the AT&T and the Sprint versions of the HTC One will be up for grabs with free goodies, which include a $50 Google Play gift card and a $10 coupon, when the smartphone is purchased from RadioShack with a two-year contract. Those who are interested in getting the HTC One on T-Mobile will get a special car kit. The latest flagship smartphone from the Taiwanese manufacturer has already reached our office and we have completed its review so feel free to check it out while you wait.